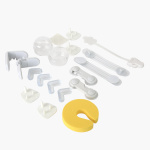 B-Safe 18-Piece Baby Safety Set | Multicolour | A complete set of safety kit. Lock and latch your doors and drawers as you get this safety kit for your little darling's protection. It is easy to use and is high in utility as you can secure any nook and corner of the house with it. Feature 1 : A complete set of safety kit. Feature 3 : Protect your little one from danger in the household.